Summer is fast approaching and with that comes thoughts of sunshine, warmer weather and smaller fitting clothes. Those thoughts make me slightly excited and slightly cringe with fear, as this means bikini season is around the corner! It’s that time of year again to clean up the diet, and go a little harder at the gym! And, having a background in nutritional biochemistry and spending the past 10 or so years in the supplement industry formulating products, I am always looking to try out the latest fat burner to assist me in my get ripped quest! This time, I was lucky to come across a new thermogenic fat burner, Thermo Heat launched by Advanced Molecular Labs and founder Steve Blechman, the very person who revolutionized the fat burning category with the launch of Twin Lab’s original Ripped Fuel. Having experienced how effective Ripped Fuel was, I was eager to give Thermo Heat a try. At first glance of the ingredient panel, I noticed there are a lot of ingredients, but as I started to dissect each ingredient and uncover the science around the product, I soon found out each ingredient certainly has a purpose when it comes to increasing the body’s metabolism and unlocking the fat burning processes. 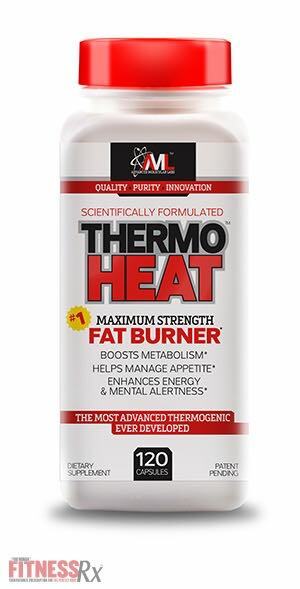 Thermo Heat’s synergistic ingredient blend works on multiple levels of fat burning. There is not only a lot of clinical research to support the effectiveness of this product, but it’s also some pretty advanced and technical stuff in the realm of fat burning biochemistry. So forgive me in advance if the science I’m about to discuss is a bit complicated. I myself had to review it a few times, before I could fully understand the concept behind this thermogenic. Thermo Heat is formulated to stimulate BAT or brown adipose tissue. BAT is made up of fat cells that generate heat, due to its high concentration of UCPs – uncoupling proteins. UCPs uncouple fat oxidation from ATP production allowing the body to generate heat without making energy. BAT is usually activated in response to cold temperature exposure, which is termed – non-shivering thermogenesis. Recent research, however, has discovered that there are other ways to stimulate BAT, including a few effective ingredients that you can find in Thermo Heat. These include caffeine, capsaicin and tyrosine. Capasicin binds to a receptor that stimulates the BAT signaling pathway triggering the release of the fat burning hormone norepinephrine while tyrosine also boosts norepinephrine release. Circulating norepinephrine binds to beta-receptors on BAT triggering the production of cAMP. This influx of cAMP leads to greater signal activation of fat burning enzymes and increased fatty acid oxidation or fat burning. While caffeine makes sure cAMP can do its job by blocking the enzyme that degrades it! Basically, together these ingredients enable more fat burning for a longer period of time! In addition to these ingredients, Thermo Heat also delivers Urosolic Acid and Oleuropein found in Olive Leaf, which have both been shown to increase BAT and even UCP in the body. The even more awesome thing about Urosolic acid is that it can also activate IGF-1 signaling in skeletal muscle, which can subsequently help to boost muscle growth while at the same time increasing thermogenesis and reducing body fat. So you can cut the fat, and keep the muscle while dieting. Thermo Heat goes one step further and delivers the patented ingredient Advantra Z, also known as Bitter Orange, which provides the active beta-agonist Synephrine. Synephrine binds to beta-receptors that stimulate fat metabolism, but unlike Ephederine, Synephrine binds different receptors including beta-3, which are found in BAT. Therefore, Synephrine has a less stimulating effect on the cardiovascular and nervous system, while still having an effect on increasing metabolic rate and thermogenesis. Lastly, Thermo Heat also delivers ingredients that support healthy thyroid metabolism. You probably already know that when you diet, especially for prolonged periods, your metabolism can start to plateau and thyroid function can start to slow. Thermo Heat provides Kaempferol and Bile Acids to help trigger thyroid production also known as T3. Increases in T3 further enhances the stimulation of UCP and BAT thermogenesis. After my first dose, I could already feel Thermo Heat working—it was a warm rush heating me up from the inside followed by a steady supply of energy! Fast-forward a few hours later, and I was expecting my steady energy to come to a screeching halt, but it never did. In fact, I didn’t experience any crashing effects. My energy levels remained steady throughout the day and maintained right into my workout. Probably the best aspect of this product for me was the curbed appetite. Come my second meal of the day and my usual ravenous self was eating less! Even though I’m on a reduced calorie, and low carb diet, I actually found myself leaving food behind. Come workout time, I blasted through the weights, and bolted through my sprints with steady energy and endurance! In addition to all the supportive science Thermo Heat is backed with, the real test always comes when taking the product and Thermo Heat definitely delivers! Although I have only been using this product for a short-while, I am already experiencing its tremendous results! My go-to product for this beach bikini season is definitely Thermo Heat! Want to know more about Thermo Heat? Visit the Advanced Molecular Labs website for in-depth information.